This year we have had many new people walk through our door. Some of which were would be members, others were one to one clients but the majority have been here to enrol on one of our signature programmes. Everyone who comes here for the first time have one thing in common, they’re always nervous. It’s the same as doing anything new, you never really know what to expect. It’s like reliving the first day of school. However, one member in particular stands out as being exceptionally nervous and that’s was our very own Sarah Cawkwell and I’m sure Sarah will be the first to admit this. Prior to actually starting, Sarah had already made a huge impression on Myself, Ross and Sarah by producing a series of blogs (which are absolutely brilliant and are more than worth a read) in the run up and beyond her start day. Once we’d gotten over the initial meet and greet and those dreaded measurements (I told you you’d learn to love them Sarah). We began the session. Just like every new starter we’ve ever had Sarah initially struggled to get the hang of some of the exercises. The tyre flip immediately stands out as being such an exercise. I actually joked about this with Sarah just the other the day… I’m pretty sure for the duration of that first session you must have thought that tyre was welded to the floor because it certainly wasn’t flipping anywhere. Another thing that stood out with Sarah was not once during this initiation stage did she stop smiling and put herself down. In fact, every failure was met with her usual whit and a degree of determination that it won’t be this way for ever… Sure enough next week came around, only this time she was able to flip that tyre on her own… only once but none the less the improvement was already evident and this carried on week after week until she was flipping that tyre for fun! I think everyone on the night class will agree she’s literally became a figurehead for the programme, a huge shot of personality injected into every session that undoubtedly has pushed everyone around her onto bigger and better things. Some days she literally keeps the RT Fitness Facebook Group going on her own. We love nothing more than client interaction and Sarah epitomises that. The thing about it is it’s all great content every time I see the notification I know it will either be informative, humorous or important. I wish I could keep the content as fresh. 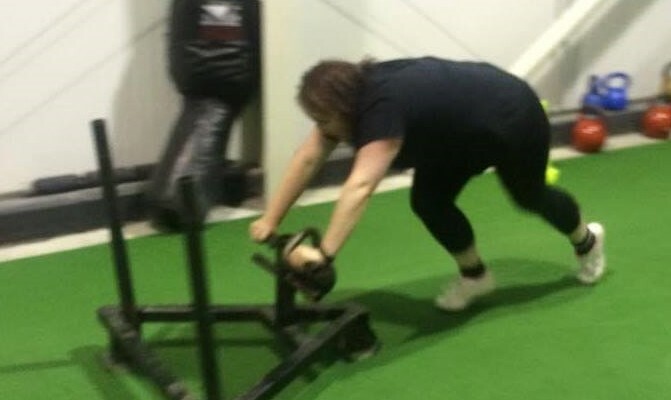 Another and perhaps the most impressive thing about Sarah is the fact that in 3 months she’s never really missed a session and in that time I really can’t recall her putting any less than 100% effort in. People often think it would be almost impossible to maintain that level of commitment whilst working full time or managing family life. Well Sarah does all of this and more. During this time not only has she worked full time she’s also changed jobs in the middle whilst balancing out the same family commitments as everyone else. On top of this she is also an active author who’s written a number books (real ones as well, published the lot). Hardly surprising given her writing style and the quality of content included in her blogs. She’s also never once complained about it; how many people can say that. I’ve previously mentioned she needs to give me lessons in productivity (I’m sure she thinks I was joking) because she is literally superhuman.